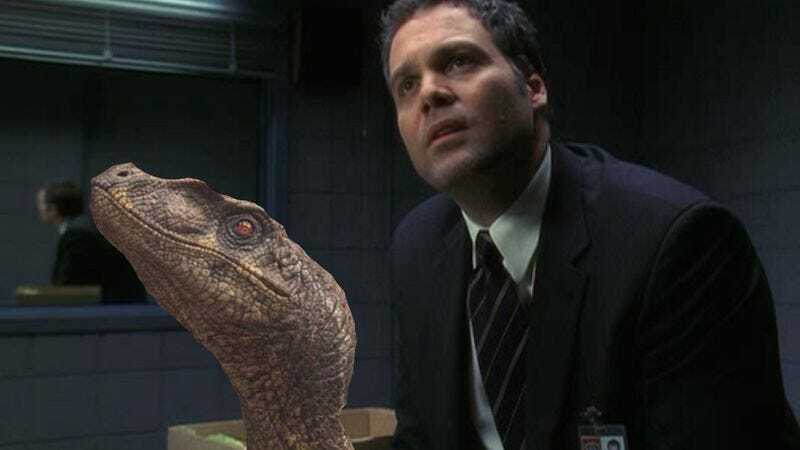 Deadline reports that Vincent D’Onofrio has been cast in the upcoming Jurassic World as the villain—the human villain whose machinations merit distinction as especially “villainous,” even amid giant dinosaurs eating everyone. It’s unknown as yet what those machinations will be, though we do know D’Onofrio has previous experience playing the bad guy in big, Spielberg-produced franchises, from his turn as a giant alien cockroach in Men In Black, and by co-starring in the Stallone/Schwarzenegger prison film Escape Plan, he’s even worked with caged dinosaurs. D’Onofrio joins confirmed cast members Chris Pratt and Bryce Dallas Howard, rumored co-stars like Jake Johnson and Ty Simpkins, and the newly added Bollywood star Irrfan Khan in Colin Trevorrow’s film, which needs to stop casting humans and start casting dinosaurs pretty soon, otherwise this is going to be one big letdown.